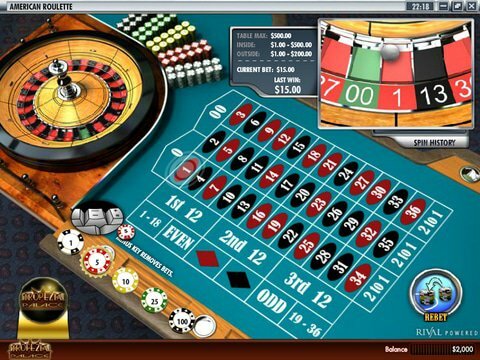 American Roulette from Rival is a great choice for Canadian gamblers who are interested in stepping away from slots and video poker and find free games online to enjoy . It offers up different speeds of play and other customizable options for sounds and viewing your bet history. You can check it out right here on this page with the American Roulette free play demo that is available with no download and no registration. In fact, since you don't have to download anything, you can even review it on your favorite mobile phone or tablet. American Roulette isn't the world's favorite variation since there are two zero pockets that can produce an instant loss. The goal here is to choose a number or a group of numbers where you believe the ball will land in order to claim the prize. The lesser the odds of winning a particular bet, the higher the prize you can receive if you do. The best options are always the "even money" wagers on red or black, high or low, and odd or even numbers. If you want to really go for the gold, single-number "straight bets" are very difficult to win thanks to low odds, but they can produce payouts of 36 to one. The good news is that you can enjoy this title with no risk in order to learn the ins and outs, play around with some betting strategies, and figure out your favorite combinations. You'll be able to bet anything from $1 to $500 per spin of the wheel, and if you run out of play money, all you have to do is reload the page. The graphics are very pleasing, and you'll note that the main view looks down at the table from above while a window in the top right corner shows a close-up of the spinning wheel.